This backup file stores the realm's configurations as they where before a change was made. Because these backup files are created upon each saved to a realm, they can pile up quick and take up a lot of hard drive space. **Warning: The primary web.config file is crucial to the functionality of each SecureAuth realm. If this file is deleted from any realm's file directory, the realm will break. Proceed at your own risk and pay close attention of the details below. These backup files can be selected and cleared in bulk by doing the following. 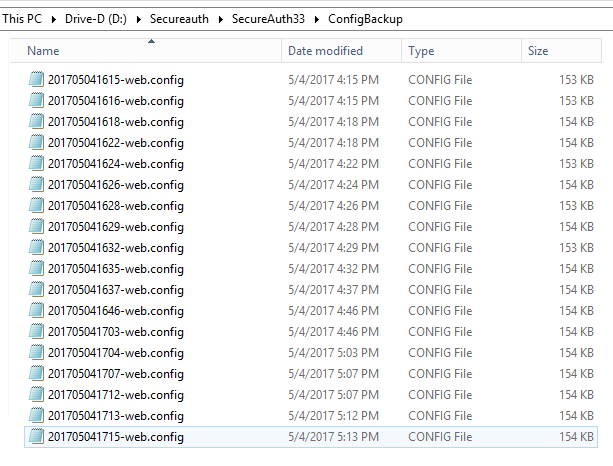 *-web.config: searches the current file directory for all backup -web.config files. This wild card search string will exclude the all currently used web.config files found in each realm's root file directory. Each backup file should begin with a integer value representing the date and time that the backup was created. - Once the search completes, Ctrl+A can be used to select all files. - Press the Delete keyboard key, or right-click and select Delete, to remove all found web.config backup files from the IdP server.